Since we introduced our original patented EOTech Lens Covers for the 511, 512, 551 and 552 our customers have been asking us to develop models that would fit the EOTech 516, 517, SU-231/PEQ (553), 555, 556, and EOTech 557. 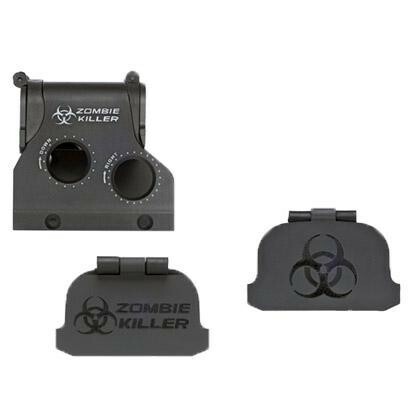 In order to meet the many EOTech configurations, provide easy installation and keep the price point competitive, we decided to offer these super lens covers with a new enhanced 6061 T6 aluminum hood in a combo package. The GG&G EOTech flip up lens cover is easy to install. You only have to remove the EOTech hood and install the new hood and lens cover module. The GG&G hood is Type III hard anodized matte black to mil-spec and matches the original EOTech finish. All of the windage and elevation calibration markings on the GG&G hood are fully engraved and present an off-white appearance to make it easier for the end user to reference. The GG&G Hood And Lens Cover Combo will fit EOTech models 516, 517, SU-231/PEQ 553, 555, 556 and 557.